Not since the advent of the television ad in 1941 has the potential for new ad formats been so great. The emergence of digital platforms is enabling marketers to experiment with a number of new ad formats, each of which could revolutionize marketing as we know it. Throughout 2014 we have been highlighting the most effective techniques being broadly adopted. What Ogilvy opposed was misdirected creativity. Creativity for its own sake, rather than being employed to promote the brand. Ogilvy recognized that advertising is not a commodity, but rather that ads vary in their effectiveness at selling the product – in a big way. 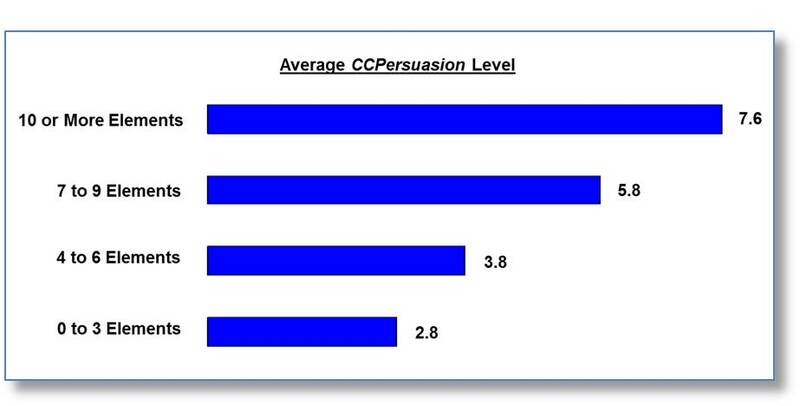 Results from advertising research studies have firmly established that the sales effectiveness of advertising can differ greatly among different pieces of copy. The following graph shows the distribution of CCPersuasion scores indexed to norm from the MSW●ARS database for tests of all media types conducted in the past three years. Less than a quarter of ads score within 20 percent of the norm, while a full 40 percent of ads score at least 60 percent above or below norm. So the range in levels of creative quality is substantial. This is also true when you look within brand and at different types of media, both traditional and emerging. 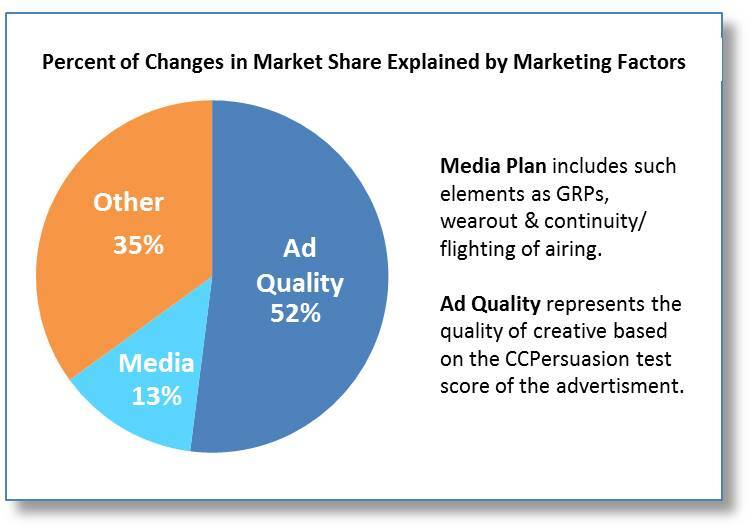 As displayed in the following tables, in three anecdotal case studies covering television, print and digital media, two ads for the same brand tested at the same point in time had vastly different levels of sales effectiveness as measured in copy testing. A brand that assumes all ad creative is equally effective is taking quite a large risk. Through the assembly of in-market sales results for brands whose ads had been tested before airing, MSW●ARS built a database of hundreds of cases that demonstrates just how important creative is. Analysis of this data set has shown that 52% of shifts in brand market share are attributable to the quality of the creative. In fact, creative is seen to be four times more impactful in influencing sales than key media planning variables. Never stop testing and your advertising will never stop improving. Appropriate research can quantify an ad’s creative quality level. MSW●ARS’s Touchpoint PlusTM system is unique in that it has the flexibility to test the sales effectiveness of any type of media, including the emerging formats discussed in this series, either alone or as part of a cross media campaign – providing a consistent, calibrated and extensively validated metric of creative strength. So, good research provides the key to maximizing the value of creative by identifying ads that will effectively sell the brand and projecting which ad is likely to produce the largest return on investment. We can say this with confidence due to the extensive body of validation supporting advertising testing techniques. 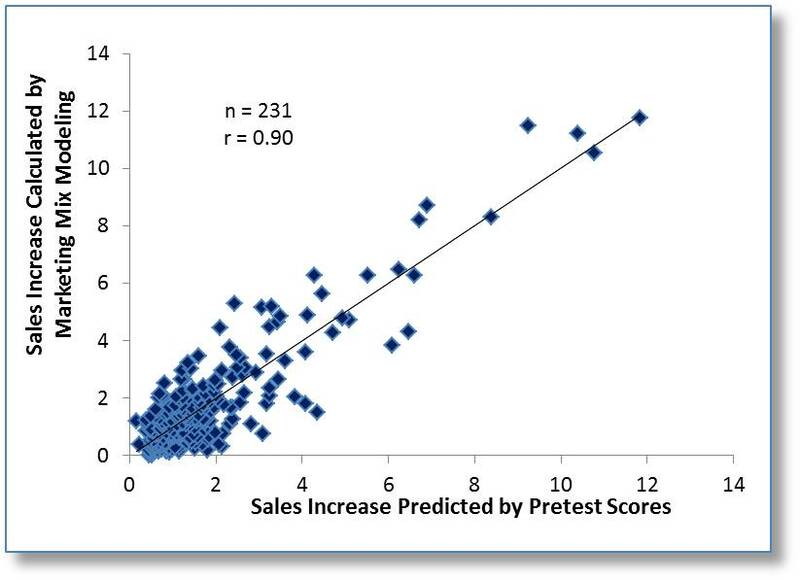 As an example, the following chart shows how accurately advertising testing results predict actual sales volume impacted by the ad, as determined through marketing mix modeling. In addition, research has more to offer when it comes to the advertising development process. As the following clip shows, David Ogilvy had some pretty strong opinions on the best point of leverage. Research done by MSW●ARS also vividly illustrates how getting the promise, or basic selling proposition, right before creative development commences will greatly improve the likelihood of an ad’s success. 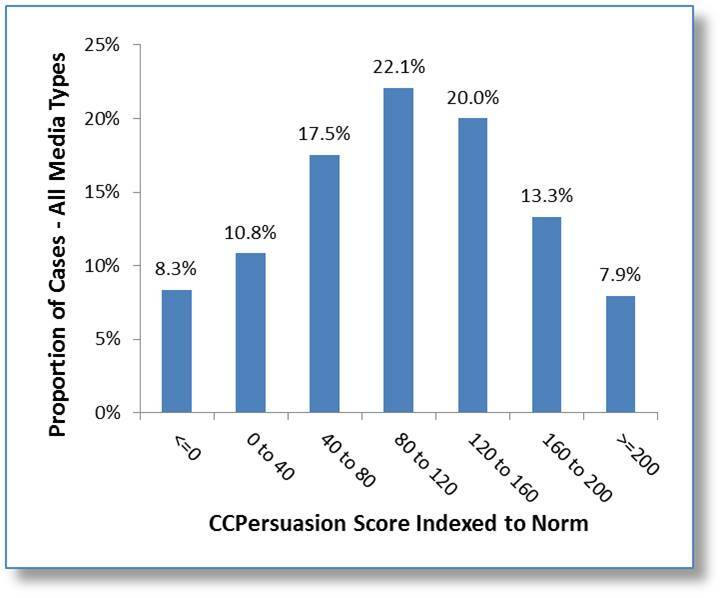 Specifically, in studying more than 200 ads for which the basic selling proposition was tested before creative production, 70 percent of ads based on an above average proposition were also above average (vs. norm); while 65 percent of ads based on a below average proposition also were significantly below norm when tested. Thirty years ago MSW●ARS teamed-up with Vanderbilt University and The Marketing Science Institute to identify advertising content elements proven to influence an ad’s potential selling power. The “validated” content drivers identified by this study, which incidentally was recognized by the Journal of Advertising Research as an article that has “stood the test of time”, have been refined and updated over time and now provide important guidance to advertisers and their agencies when developing creative. That these validated content elements can help a brand effectively deliver on a strong selling proposition is well documented, as the following chart demonstrates. Inclusion of more of these content elements is seen, on average, to substantially improve an ad’s selling power. While Ogilvy clearly had an appreciation for research, he also had a sense that at times something was missing from the tools available at the time. The trouble with market research is that people don’t think what they feel, they don’t say what they think, and they don’t do what they say. Ogilvy perceived that consumers didn’t or even couldn’t rationally express their true feelings or reactions to a product or advertisement on a conscious level. It is now widely believed that consumers’ choices are driven not only by conscious opinions but also by their subconscious reactions. That is, our brains make snap judgments while in “autopilot” mode. The veiled, behavioral methodology used to collect the CCPersuasion measure allows for this type of decision making. Furthermore, a tremendous amount of scientific research has been published regarding techniques for measuring and understanding these gut-level, or System 1 responses to stimuli – and they are being used to provide a richer understanding of consumers’ reactions to advertising. EEG, galvanic skin response, facial coding, reaction times and eye tracking are some of the techniques MSW●ARS employs to help marketers understand how consumers feel about an advertisement and its various segments on a sub-conscious level, adding a new dimension in understanding how great creative is achieved. A contemporary of Ogilvy, the esteemed quality expert Philip Crosby, was fond of saying that “quality is free”. Indeed, ROI calculations have shown that application of the research techniques cited above can move typical advertising quarterly returns from $0.54 on the dollar to $1.24! This makes the research not only free, but a wise investment. However, for this to occur the research needs to be applied in a manner that frees creative judgment, not displaces it. It should give confidence to marketing teams to experiment with radical ideas knowing that the insights gained will remove the obstacles to implementing truly breakthrough creative. The advertising landscape has been rapidly changing. Technology has enabled new advertising formats to emerge and quickly develop, and advertising spending is shifting rapidly from traditional media to digital, mobile and other emerging formats highlighted in this series. But despite these changes, one thing remains the same – the importance of creative quality in driving the brand’s return on its media investment. Please contact your MSW●ARS representative to find out more about how our products and research findings can help your brand in its quest for great creative.